Two Russian nationals, one of whom allegedly assaulted a miner in Cuyuni on Friday, are currently in police custody at the Bartica Police Station. Rickford Burke, head of the New York-based Caribbean Guyana Institute for Democracy (CGID), had posted two videos on social media showing an employee of the mining company communicating with one of the Russians, explaining to him about the company’s claims to the land and why they did not need permission to be there. The Russian, who spoke briefly in English in the video, was then seen laughing as the worker tried to continue his explanation of his company’s claims to the land. The video ended abruptly and the second video showed the confrontation at a later point. The Russian and the mining company’s worker were still in conversation, which then degenerated as the worker was hit by the Russian. After the worker retaliated, the Russian punched the worker, which resulted in a scuffle that lasted a few seconds. The Russian then stood back and drew his gun, as the video ended abruptly. 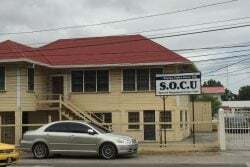 The altercation was subsequently reported to the Bartica Police Station on Sunday and the team was sent yesterday. The police noted that following the circulation of the video, a thorough investigation was launched and a Police Investigative Team from Headquarters was sent in. They were assisted by a miner who ferried them to the area – Quartz Stone – where the incident occurred. As a result, the two Russians, one of whom allegedly assaulted the ranger from Hopkinson Mining and Logistics Company, are in custody assisting with the investigation. The two men are reportedly employed by West Bank Demerara Gold Inc. and are sworn supernumerary constables and authorised to carry firearms. However, the police noted that the two men should have been dressed in the prescribed uniform that is approved by the Force’s Administration for the company and not as they were seen in the footage. The owner of Hopkinson Mining and Logistics Company, Shaun Hopkinson told Stabroek News on Monday that he had been informed of the August 3rd assault and had condemned it. Hopkinson noted that his company has claims in the area dating back to the 1980s and they would usually send their rangers to make spot checks. He also noted that persons around the area have had various altercations with the Russians. However, Commander of ‘F’ Division, Kelvin Adonis had stated that there were no prior reports of similar incidents. 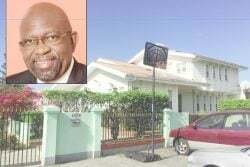 In an invited comment on Sunday, Minister of Natural Resources Raphael Trotman had also condemned the assault and said he was calling on the Guyana Geology and Mines Commission (GGMC) to launch an investigation. The National Mining Syndicate of Guyana, via a press release, also said that they are appealing to the relevant agencies such as the Department of Labour, GGMC, Ministry of Foreign Affairs, Ministry of Public Security, Ministry of Citizenship and the Ministry of Natural Resources to launch an investigation into the matter.